No Duplicate Ads - Do not post multiple ads in the same categories. Only post one ad per category.Please don't post the same ad (even if re-worded!) more than once either in the same category or across multiple categories. If there are a few possible areas for your ad then please choose the most relevant. Post in the correct category - Please post in the correct category as it helps both posters in reaching the right audience with their ad and helps the users looking for something to find what they want. Responsibility for content - You understand that all listings, linked from the site are the sole responsibility of the person or organization from whom such content originated. You also understand that TapUAE do not control and are not responsible for content made available through the service, and that by using the service, you may be exposed to content that is offensive, indecent, inaccurate, misleading or otherwise objectionable. The service and content made available through the service may contain links to other web sites that are completely independent of TapUAE make no representation or warranty as the accuracy, completeness or authenticity of the information contained on such web site. User conduct - You agree to act responsibly and to treat other Tappers with respect. Users also must not use the service to harass or abuse other users. Individuals who have demonstrably harassed other individuals may be removed from or blocked from the service. 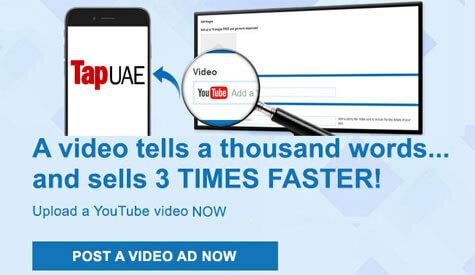 Some of TapUAE features may display your ad on other sites, services, applications and tools that are part of the UAE classified community, such as Facebook, Google, LinkedIn or our classifieds sites in other emirates. By using TapUAE, you agree that your ads can be displayed on these other sites, services, applications and tools. The terms for our other sites, services, applications and tools are similar to these terms, but you may be subject to additional laws or other restrictions within UAE where your ad is posted. When you choose to post your ad on another site, service, application or tool, you may be responsible for ensuring that it does not violate such other site, service, application and tool policies. We may remove your ad if it is reported on any our sites, services, applications or tools, or if we believe it causes problems or violates any law or policy. Using TapUAE is generally free for Classifieds and Free Stuff, but we charge a fee for certain categories – Motors, Property for Rent, Property for Sale and Jobs. If the service you use incurs a fee, you'll be able to review and accept terms that will be clearly disclosed at the time you post your ad. Our fees are quoted in UAE AED. We'll notify you of changes to our fee policy by posting such changes on our Tapper’s Dashboard. We may choose to temporarily change our fees for promotional events or new services; these changes are effective when we announce the promotional event or new service. Do not post content that infringes the rights of third parties. This includes, but is not limited to, content that infringes on intellectual property rights such as copyright, design and trademark (e.g. offering counterfeit items for sale). A large number of products of all sorts are offered on TapUAEby private individuals in Dubai. Entitled parties, in particular owners of copyright, trademark rights or other rights can report any advertisement which may infringe on their rights, and submit a request for such advertisement to be removed. If a legal representative of the entitled party reports this to us in the correct manner, products infringing on the intellectual property rights will be removed byTapUAE. If a dispute arises between you and TapUAE, we strongly encourage you to first seek a resolution by contacting us directly at our customer service. We will consider reasonable requests to resolve the dispute through alternative dispute resolution procedures, such as mediation or arbitration, as alternatives to litigation. Nothing in these terms shall limit our liability for fraudulent misrepresentation or the negligence of our agents or employees. You agree not to hold us responsible for things other users post or do. We do review Tappers' postings but are not involved in the actual transactions between buyers and sellers. As most of the content on TapUAE comes from Tappers, we do not guarantee the accuracy of postings or user communications or the quality, safety, or legality of what's offered. TapUAE does not allow the disclaimer of warranties or exclusion of damages, so such disclaimers and exclusions may not apply to you. Despite the previous paragraph, if we are found to be liable, our liability to you or any third party (whether in contract, tort, negligence, strict liability in tort, by statute or otherwise) is limited to the total fees you paid for your advertisement. By using TapUAE, you agree to the collection, transfer, storage and use of your personal information by TapUAE on servers located in the United Kingdom and UAE. You also agree to receive marketing communications from us unless you tell us that you prefer not receive such communications.